Two trends in the world of technology are making a big splash in education: web applications and netbooks. These trends excite me because I'm all about easy, free, and cheap. There are many tasks that used to require software that you can now do from inside of your Web browser. These sites and services are called web applications. They are sometimes called webware because they are like software but stored on the Internet instead of on a computer's hard drive. Web apps are great for students and teachers because they are usually free and do not require software to be installed. Because they run in a web browser, web apps are cross-platform, so it doesn't matter if you are running Windows, Macintosh, or Linux operating systems. Because Web apps and their data are stored online, students and teachers can access the apps and data from anywhere (this is called cloud computing). 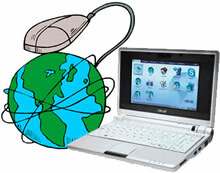 Teachers and students can access web apps on any school computer and also their computers at home. Some web apps even give access on mobile devices. Another bonus: web apps tend to facilitate online sharing and collaboration. Since web applications don't require a specific operating system, most all of them work perfectly fine on ultra-compact and inexpensive laptops like ASUS's Eee PC. The Eee PC 2G Surf model has a 7 inch screen, 3 USB ports, SD slot, 900 megahertz processor, Wi-Fi, 2 gigabytes of storage, and 512 megabytes of RAM. It uses flash memory, making for a 20 second boot-up time. It also has a VGA port for connecting a monitor or projector (super useful for showing the screen to a group of students). The Eee PCs specifications aren't impressive, but its $299 price tag is. That's the entry level 2G Surf model's retail price. One way ASUS is able to keep costs down is that the notebook doesn't run Microsoft Windows. Instead, it runs a version of Linux, a free and open-source operating system. I have found learning to use the Eee PC really is easy. It's similar enough to Windows and Macintosh that I had no problem figuring out how to launch programs and save and open files. In fact, ASUS says the Es stand for "Easy to learn, Easy to work, Easy to play." By the way, Eee PC is pronounced with just one E (think E-P-C). The Eee PC was a top-selling item for Amazon last Christmas. Its popularity has inspired other companies to come out with little notebook computers. Some of these include the HP Mini-Note, Everex CloudBook, and MSI Wind. See a chart comparing models. So far my favorite is the Eee PC because it has the lowest price. Anything above $300 has to get you wondering if your money should go to a full-sized laptop. Dell sells 15-inch laptops for less than $500. Advantages to using netbooks in schools is that they are about the size of a hardcover book, easily fitting into a backpack. Would-be thieves can't tell a netbook is in a bag, unlike when students tote around laptop bags. Because netbooks are so small, they can have a place on a desk along with a textbook. Additionally, netbooks tend to have quick boot-up times, taking just 20 seconds to power on. Also, being relatively inexpensive, schools may be able to charge fines for broken or missing netbooks. Schools or parents may be able to take out insurance policies on netbooks too. Unlike handheld computers, netbooks look familiar to administrators, school board members, and the community. It's easier to convince those who control funds to purchase netbooks for students because they look like laptops. There are a few disadvantages. For me, a 7-inch screen is useable, but I'd really rather have something larger. Netbooks do come with larger screens, but those pass the magical $300 price point. However, I don't think students will have the issues with the small screen as much as adults. Similarly, adults may have problems with the smallish keyboard but students, particularly younger ones with small hands, do not have any issues with it. Another disadvantage is battery life. I was able to get 2 hrs and 17 minutes of continuous Wi-Fi use out of my Eee PC. Though, more expensive netbooks have better battery life. I see classrooms that use netbooks needing lots of power strips to keep their computers charged. Also note that Netbooks are so small that they don't have CD drives. A disadvantage that may actually be an advantage is that it may be hard for schools to decide which netbook to buy. The technology is continuously getting better and cheaper. What's important to me is a low price and wireless Internet access because I want to access web apps. When its time to replace or add more netbooks, it really doesn't matter much if the same exact model is available. Focusing on web apps means that any computer with a browser should work the same as what you already have. In the fall I'm helping some schools use web apps and netbooks with students. Not only will you be reading more about these trends from me, but these are trends in consumer electronics and in education that you'll be seeing lots of in the coming year.